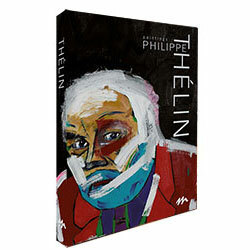 Philippe Thélin - signed and numbered bibliophile limited edition, includes 160 exceptional artworks of Philippe Thélin and several writings. Philippe Thelin, born in 1950, lives and works at Montreux (Switzerland). He is a geologist, PhD degree at Lausanne University. Post-doctoral fellow in University of Western Ontario, Canada. Researcher-teacher at the Institute of Mineralogy and Geochemistry, Lausanne University (1977-2009). Topics of research: Alpine geology, low-grade metamorphism, clay mineralogy and X-ray crystallography. Self-taught painter, he began his artwork in 1994 after a breakdown. Till 2012, he kept his artwork for himself.